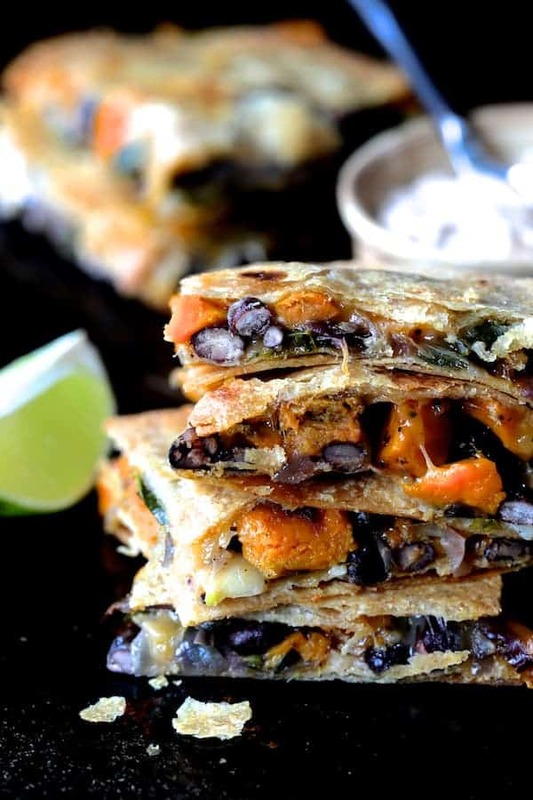 Sheet Pan Quesadillas with Sweet Potatoes, Poblanos and Black Beans with Chipotle Sour Cream are a delicious light vegetarian meal or appetizer! Are you ready for the crazy Thanksgiving holiday week? My family has a great deal to be thankful for this Thanksgiving! As I mentioned in previous posts, my father and sister were in a bad car accident several weeks ago. All my dad’s ribs on his right side and two on his left were broken. It’s really tough seeing someone you love so much in so much pain! Complications such as pneumonia could have also occurred. My father was able to go home from the rehab facility on Thursday. I spoke to him yesterday and he said every day IS just a little bit better. 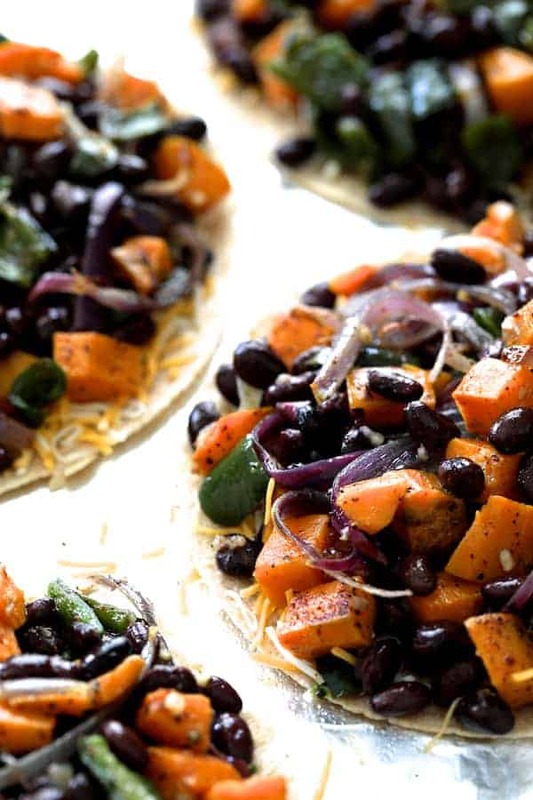 Because this is a week where we all indulge, here’s a light and healthful way to enjoy a meatless meal without a lot of hands-on time: Sheet Pan Quesadillas with Sweet Potatoes, Poblanos and Black Beans with Chipotle Sour Cream! 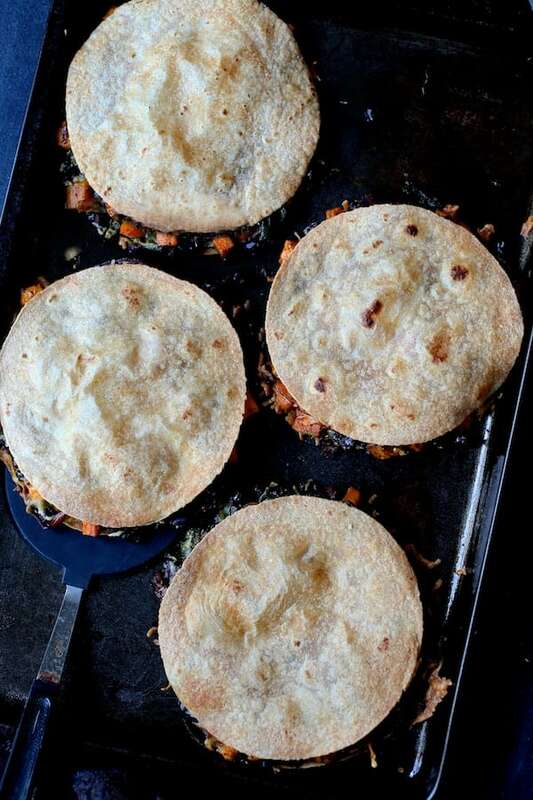 These sheet pan quesadillas do require a fair amount of oven time, but once prepped and in the oven, you can do other things. When I’m cooking for one of my personal chef clients, I generally line my baking sheets with aluminum foil if they have no objection. I’m a huge fan of nonstick aluminum foil! Clean-up is so much easier! Whether you line your baking sheet first is up to you. If you line your baking sheet first, you can simply lift the roasted vegetables off the baking sheet and continue with a clean baking sheet. Because I bake these quesadillas rather than fry them and I don’t have to worry about filling falling out when they require flipping, I really fill them up! Give the top tortilla a good shot of cooking spray and bake until it’s crispy and the cheese melts. These can be made ahead to this point and baked at a later time. A word about cooking sprays: Some people find them objectionable because of the added chemicals and propellants. However, there are numerous good ones available now that are all-natural. 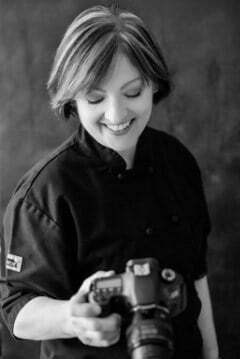 Check out this information from Rodale: Best All-Natural Cooking Sprays. You can even make your own cooking spray! Whenever we make quesadillas, serving this chipotle sour cream alongside is a must! 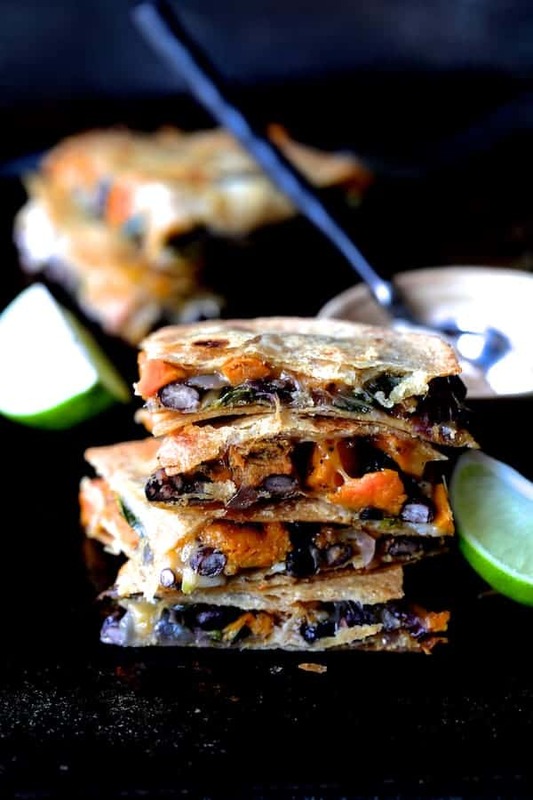 Sheet Pan Quesadillas with Sweet Potatoes, Poblanos and Black Beans with Chipotle Sour Cream! QUESADILLAS: Preheat oven to 375 degrees. Line a baking sheet with nonstick aluminum foil. 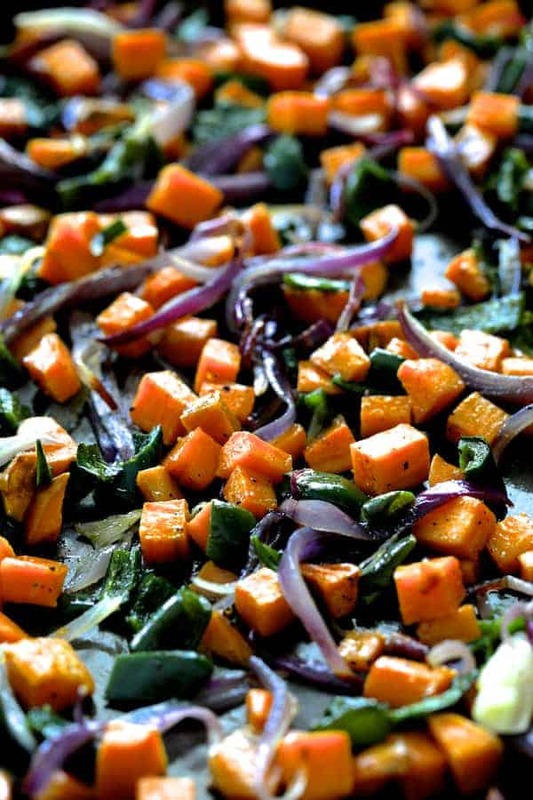 Place sweet potatoes, Poblanos, onions and garlic on prepared baking sheet. Drizzle with olive oil and sprinkle with chili powder. Roast for 20 to 25 minutes or until sweet potatoes are tender. Add beans and toss to combine. Carefully pull the foil up with the sweet potato / black bean mixture and set aside. Place a clean piece of nonstick foil on the baking sheet you used. (If using a nonstick baking sheet, you can omit lining it again as you'll have a clean baking sheet.) Spray the foil or the nonstick baking sheet with cooking spray. Place four tortillas on the prepared baking sheet. Place 1/4 cup cheese on each tortilla. Top with even amounts of the sweet potato / black bean mixture and top again with 1/4 cup cheese. Top each with a tortilla, pressing down to secure. Spray the top of each quesadilla with cooking spray. Bake for 18 to 20 minutes or until the cheese is melted and the tortillas are crisp. Serve immediately with Chipotle Sour Cream. CHIPOTLE SOUR CREAM: Combine ingredients in a small bowl and serve with quesadillas. Just made this. Wow wonderful. Easy and fantastic. I made a couple of tweaks. I didn’t have chipolte chili in adobo so substituted ground green hatch and chipotle chili powders along with cumin. And added a chocolate chili coffee spice rubbed ny strip. Just fantastic. Thanks so much, Peter! Yes, I think this recipe is very versatile. Could add chicken if one so desires but that New York strip sounds AHH-MAZING! Thanks again and so glad you enjoyed! Thanks, Neyssa! Hope you enjoy and thanks so much for subscribing!